Pebbles is missing. She is a Calico with all white feet, and under belly. She is missing two teeth 1 upper fang and 1 lower fang. Her collar is pink with a heart shaped name tag, Pebbles Golding. She also is wearing a pink walking harness. 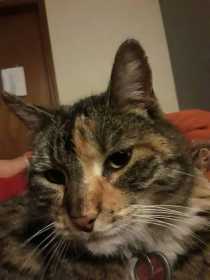 Pebbles went missing 4/1/19. We are staying at the Oregon 8 Motel on hwy 97 right past Wocus rd. She loves to hunt so she was out hunting and we are worried because she hasn't come home for hours. She NEVER stays away this long. Please he bring our baby home.